Motorola has been promising a tool for developers to unlock the bootloaders on their phones for a long time now. So long in fact, that we have pretty much given up hope of ever seeing another Moto phone like the OG Droid which was the hacker’s paradise. 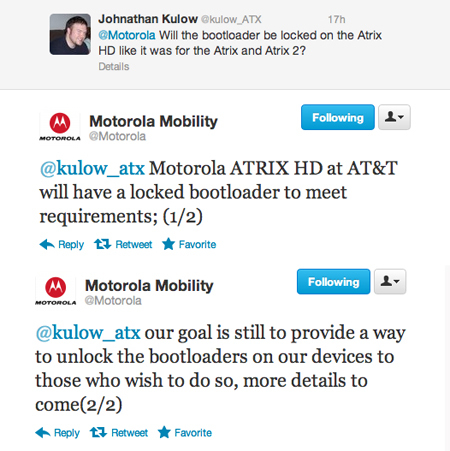 Anyone who was hoping that the new AT&T Atrix HD would have an unlockable bootloader is going to be sadly let down, it’s locked and encrypted like all the other ones, but Moto took to Twitter to say that it might not be locked for long or that they potentially have an option on the way. It’s been almost a year and a half since Motorola originally said they would partner with developers to work out some kind of solution and still we have nothing. HTC has been doing fantastic things with their HTCDev website and that just serves to show how backwards Moto is being about the whole thing. Do you think we will ever see this developer unlocking tool? Or is it too late for Moto to catch up?